Driving in the pouring rain is a challenge, more so when the heavy rain is coupled with thunder, lightning and strong winds. Earlier this afternoon, Palm Beach and Broward counties experienced severe thunderstorm. I was glad it was a non-working day for me and I was at home. Driving in the heavy rain is difficult but it is nothing compared to snowy, icy or muddy roads. We have heard or read in the news about vehicular accidents happening during these extreme weather conditions. Good thing there's the tire chain. 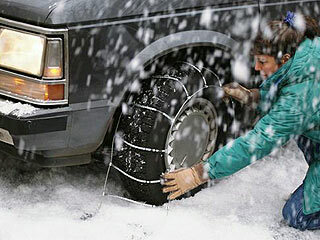 It gives extra traction needed in snowy, icy and muddy roads.